Automating common tasks is one of the most powerful timesavers for a business. It takes some time to get right, balancing the time spent automating something vs. just doing it “the hard way”. But once you’ve figured out how to do it, it can save hours of painfully doing the same thing over and over again (e.g. typing the same email response or resizing a huge library of images). It’s easy enough to achieve on a Mac (or PC), yet thus far there hasn’t been a good solution to automate tasks on iOS (aside from developing your own apps). 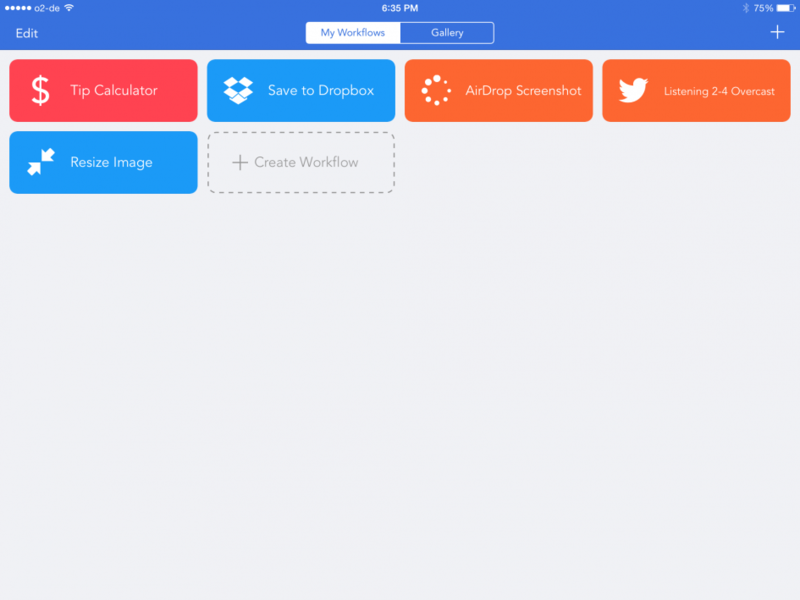 Enter the Workflow app. Granted, this app is more on the geeky side of the App store. Nevertheless, it has become an invaluable tool for automating so many tasks on iOS. It’s fairly simple – you really don’t need to be a developer to use it – yet delightfully elegant and powerful. The app allows you to piece together your own little “apps/extensions” using small building blocks you just drag, configure and rearrange. Once you’re done, you can either trigger it right there (e.g. to post the last picture taken to Twitter) or save it as an action extension to trigger from any other app that supports iOS8’s action extensions (e.g. Safari, Photos, Newsify, Overcast, Nuzzel, …). And if you don’t want to create workflows yourself or let other people figure out how to do certain things, there is a way to share workflows with other people (e.g. on Reddit). There’s even a curated gallery of really awesome workflows right in the app. if you want to find out more about the app, you can also take a look at the website. Weather your a professional designer, a weekend warrior or just trying to make a yrad sale sign that doesn’t look you you just discovered “Word Art” icon, you’ve most likely delt with the task of trying to select the perfect font for the occasion. Thanks to a set os tool sI recently discovered, gone are the days of highlighting some text and clicking the font menu a few undre times. My pick of the week is Wordmark.it an amazing tools that allows the user to see their text specimin using all the fonts installed on your system. Now you can find the perfect font with just a few clicks and even see in on light or dark backgrounds and narrow your selctions. Wordmark.it is a free web based tool but be sure to book mark it right away. For an added bonus while researchign I also found Fliping Typical a very similar tool that doesn’t require flash.